Summer outdoor concerts are the best - after ice-cream of course! Some of the things I enjoy doing at summertime is talking the family dog (a Leonberger) for a walk at the beach, drinking frappucinos (sp? ), eating soft ice with chocolate dusting and going to the local food festival. Ooh nice ones! A lot of those are hard to do/enjoy in St. Louis! Summer is sweltering here and I hardly ever go outside and do anything! LOL! Oh how I long for summer....! Enjoy! The summer movie nights at home is a great idea! I wish we still had drive-ins, but I'll have to try opening up the windows during movie night to get that outdoor feel. I think I'll wait for a cooler day though. Lately around here it's been really hot! I love swimming and shopping for summer dresses too! Great list, ladies! The beach is definitely my favorite, I miss it so much!! I've lived near the beach for most of my life but when I moved to the Bay Area that got trickier. It's a good drive away and can be so foggy! Pool reading is great too, I'm hoping to find a pool near me this summer :) Barbeques and beach bonfires are so much fun, that smell is summer to me :) Oh my gosh I'd love to go to a drive in! That sounds amazing, I love movies. This is the best list you guys! I've just bought myself an ice-cream maker, so that has added a new thing to my favourite things to do in the summer list. Great options! Top of my list, unfortunately, is doing whatever possible to remain in air conditioned rooms. >_< Another big one is hitting the outdoor theater for their summer season when it cools off a bit. 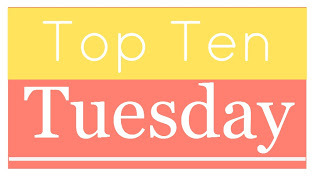 My Top Tuesday pick this week was Favorite Heroines! I love that I can go see movies on weeknights during the summer because I don't have to work early the next morning! Fun list! I love SO many of these! Lately I've been into sunbathing haha. I used to think it was boring, but now I love to listen to audiobooks or read in the sun!